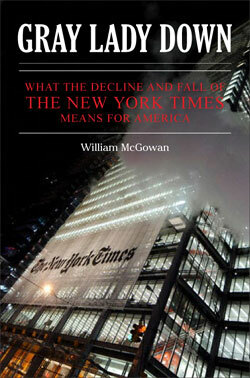 Author William McGowan and Times Book Review editor Sam Tanenhaus had a revealing email exchange recently over the prospects of the New York Times reviewing McGowan's new book "Gray Lady Down - What the Decline and Fall of The New York Times Means for America," an exchange that McGowan's publisher, Roger Kimball of Encounter Books, describes as a prime example of Tanenhaus "in weasel mode." In an email exchange obtained by Times Watch, McGowan wrote to Tanenhaus on November 22 informing Tanenhaus that he had dropped off a copy of "Gray Lady Down" for review purposes, writing: "I think the book should be read as coming from the loyal opposition, a la [former Times Public Editor) Dan Okrent, and while it may not be everywhere flattering it is, to the best of my ability, everywhere fair." Tanenhaus replied the next day, in part: "Encounter [the book's publisher] has had a stated policy for some years now of not sending us books because, as I understand it, Roger Kimball does not want them reviewed in the Book Review. Of course that is his choice. But until he changes his mind we're not in a position to consider any Encounter titles for review." Beginning today, June 23, 2008, Encounter Books will no longer send its books to The New York Times for review. Of course, the editors at the Times are welcome to trot down to their local book emporium or visit Amazon.com to purchase our books, but we won't be sending gratis advance copies to them any longer. Kimball also noted that "The Times had nothing but praise for What Liberal Media? The Truth About Bias and the News ("impressively researched and documented") by The Nation's Eric Alterman, but it completely ignored William McGowan's Coloring the News: How Political Correctness Has Corrupted American Journalism, which won the National Press Club's Arthur Rowse Award for Press Criticism but, being published by Encounter and being critical of the Times, just didn't make the cut." Calling the response by Tanenhaus an act of hypocrisy, McGowan suggested Tanenhaus used the Kimball post as a fig leaf to avoid the drama of dealing with both the book and his boss, publisher Arthur Sulzberger Jr.